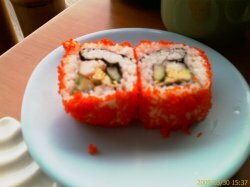 I am never a fan of that "green frog sushi place" so whenever I crave for sushi, I'll visit Sushi Tei. 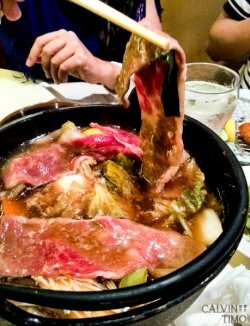 Previously, I dined at their Vivocity outlet and I enjoyed myself with great food and quality service on a weekday lunch. It was however, a far cry at their China Square Central outlet when I visited it for dinner. The restaurant wasn't very busy but the staffs seems very aloof, giving an attitude when my group of friends asked for a table for 9. They showed us to the tables but it hasn't even been clean up and told us to go back to the front counter and wait. Only 5 minutes later, we were showed to our tables again which are tucked right at 1 corner of the restaurant. We had to seat separately because each table adjoining to the sushi conveyor belt can seat only 6 pax. Throughout the dinner, flies can be seen flying around and I wonder if tables were left unclean after diners left, resulting to it. 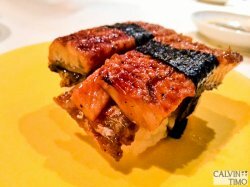 Unagi Sushi ($5.20) - It came on the conveyor belt and the thickness of the unagi caught my attention so I grabbed a plate off and munched into it. It was not bad and I love huge and juicy unagi like this unlike other Japanese restaurants. 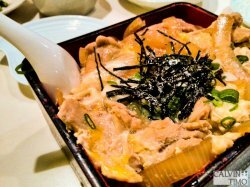 Oyakodon ($14) - I expected the eggs on it to be more runny than cooked. Although I didn't mind that, the chicken chunks were huge and tough to the bite. Overall, my dining experience was only mediocre and nothing memorable compared to what I had at their Vivocity and Paragon outlet. I hope the service and hygiene of this branch can be rectified asap. 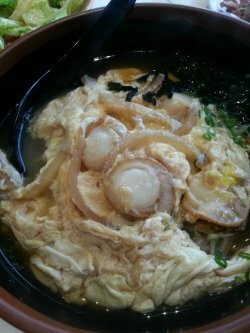 This is their scallop egg noodles (udon, soba) as the noodles you can choose your favourite and they will cook it. The scallop looks right and of course tasted right! The amount of the whole noodles are alot and i could not finish them, perhaps it can be shared among 2 ladys. 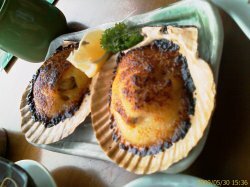 It tasted yummy and the scallop is fresh too! There is a little bit taste because of the soup.. Went for a good dinner at Sushi Tei after work on Friday. We ordered quite a number of dishes. We shared some sushi and some side dishes to share. my personal favourite is the Unagi Sushi. 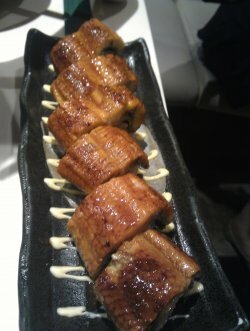 It is quite pricey at $15 for 6. but the serving of unagi is huge and it is definitely worth it. actually the unagi dish is sufficient to fill my tummy. Please try it at any sushi tei. I tried their salmon sashimi as I heard they serve good ones here. It is only $6.00 for a plate of sashimi, we can add some wasabi or soya sauce at the side according to our taste, or even mayo is available upon request too. Very unique desserts, including cakes. Cheaper than the designer Jap fusion eateries here. We've been to the Sushi Tei at Paragon and were astounded by the quality and variety of food. And the service and setting there was excellent, so we were expecting the same here. And we were happy that Sushi Tei lives up to its name. The prices are amazingly reasonable for such good quality, variety and service. It is a very convienet location if you work in this area. You can't miss it! The food is always fresh and that makes the value great. Definitely worth it to join their membership. Hopefully they will not increase their prices due to popularity! It is because they are reasonably priced that we patronise them. And their excellent standards of course. As the CBD is very quiet during the weekends, this a really good place to go, because at other Sushi Tei places, they are usually packed during the weekends. Everything on their menu is perfect, well-thought of, well-balanced in taste and beautifully presented! And fresh! We would eat here every day but that would be an expensive exercise since we order A LOT each time. Not much photos of the inside, since it's rather dark at night and using flash makes everyone look at you. And then management comes over to tell you "no photos'.